Whether You or Your Vet will treat laminitis … You should always confirm with your vet just how you should treat laminitis in your horse or pony. However, some of the best treatments you can administer yourself simply involve the comfort and care supplied by you, the horse owner. How can your vet treat laminitis? NSAIDs are used for their pain relieving effect; and are utilised together with diet adjustment. NSAIDs such as bute or flunixine are commonly used for around 2 weeks in acute laminitis cases and sometimes indefinitely in chronic laminitis cases. They effectively combat inflammation in the laminitic joint. with narcotic analgesics e.g. fentanyl patches in America, but not used much in the UK. like virginiamycin. Laminitis treatment aims to reduce the number of harmful bacteria in the gut causing the production and release of toxins. e.g. ACP the sedative (also reduces stress). Although most of such drugs have not been shown to help much in laminitis treatment. Isoxuprine has also been used. Can help in initial stages of laminitis treatment but the benefits have not been accurately assessed. Aims to improve circulation to laminitic feet but there is no evidence that it works. 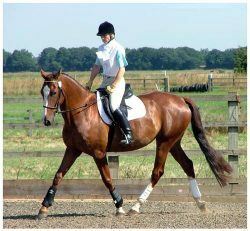 to desensitise the laminitic feet may seem sensible but it may mean that your horse will place too much weight on the sensitive feet and do even more damage. Just be aware that, although the above laminitis treatments have been tried, not all of them have been proven to be effective. Always consult your vet at all times, prior to trying any unproven treatment on your horse or pony. In order to expel food that has caused laminitis it may also be useful to use liquid paraffin or even better Psyllium husks. This is particularly important where your horse or pony has eaten too much grain or concentrates. You can and should use dietary control to help with laminitis treatment, but must remember that a lack of proper nutrients may make it more difficult and slow the healing. Nutritional supplements are very important not only for ensuring that your horse recovers but also to make sure that he or she does not become nutritionally deficient while undergoing treatment. Laminitis is really a nutritional problem and it is possible to help your horse a lot by using nutritional supplements. These are not used as medicines but to aid and possibly boost the effectiveness of the treatment your vet has prescribed. Aloe vera, probiotics and antioxidants can help a lot as well as a liver tonic, which some therapists have found to be the most effective supplement. A liver tonic supports the way the body deals with toxins that are circulating around the body and at the same time tones up the digestive system. It also has the added benefit that most parts of the body work better once the liver has improved.